POLSON — A life well lived. 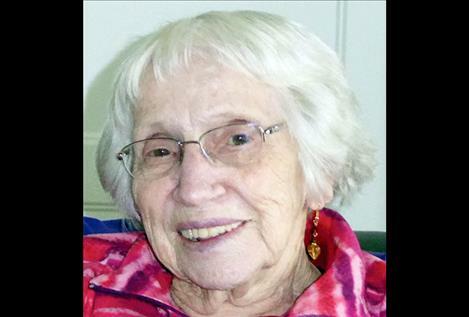 Marvel E. Marrinan, 92, died of natural causes on Aug. 5, 2018, at Mountain View Care Center in Ronan. Marvel was born to Inez and Granville Carr on Feb. 17, 1926, in Round Butte, near Ronan. She joined older brother Donald and later, siblings Tommy and Judy joined the family. She attended Round Butte grade school. The family later moved to Hot Springs where Marvel graduated from high school in 1944. During her high school years Marvel played drums and was in a band with her brother called the “Dipsy Doodlers.” She had a passion for music and dance and could always be found “tapping” her toes to the beat. After graduation she attended Telegraph School in Spokane, Washington. Upon completion of her training Marvel worked for the Northern Pacific railroad in Frenchtown. In October of 1947 Marvel married Jack Marrinan of Camas Prairie. Here with Jack she spent the better part of 63 years managing the family homestead, raising alfalfa, grain, cattle and six children. She was a hard worker but found enjoyment and relaxation in baking and sewing. You were guaranteed a cinnamon roll or some other fresh baked sweet along with a cup of coffee if you stopped by for a visit. Marvel made sure no one went hungry. Marvel worked many years as an election judge. She was active in the Sacred Heart Catholic Church Altar Society; helped with numerous 4-H programs, as well as PTA, ONO (Our Night Out), Red Hat Society and countless school functions. She especially enjoyed the year she and Jack hosted an exchange student, Julio, from Columbia, South America, whom they kept in contact with for many years. Marvel loved to travel and especially enjoyed the two trips she and Jack made to Ireland. Marvel was a good friend to many as well as an amazing mother and wife. We will miss you Marvel and your sense of humor and ability to make us laugh to the very end. You always had a unique way of keeping us humble. We thank you for that. Marvel is survived by her sister, Judy Carr Hall (Dave) of Ketchikan, Alaska; her children, Mike Marrinan of Hot Springs, Pat Marrinan (Debbie) of Bigfork, Darlene Bestwick (Don) of Whitefish, Jo Ann Bowers of Polson, Colleen Marrinan ( Jim McKenzie) of Livingston, Tom Marrinan ( Jodi O’Sullivan) of Polson; her daughter-in-law, Peggy Marrinan of Lakeside; her 12 grandchildren, Sarah Marrinan, John Marrinan, Matt Marrinan, Annie Crone, Heather Kislewski, Tim Craft, Andy Bestwick, Michael Bestwick, Katherine Bowers, Jessica Dupuis, Ella McKenzie, Colin McKenzie; her nine great-grandchildren, and several special nieces and nephews, including niece Judy (Don) Granston of Snohomish, Washington, who was a flower girl at Marvel and Jack’s wedding. She is preceded in death by her husband, Jack; her parents, Inez and Granville; her brothers, Donald and Tommy; and her son-in-law, Bob Bowers. Donations may be made to Camas Prairie Neighbors Fund c/o Dale Nieman, 250 Camas Creek Rd., Plains, MT 59859 or a charity of the donor’s choice. The family would like to express their gratitude to the wonderful staff of Mountain View Care Center in Ronan for the love and care they have given Marvel these past several months. Messages of condolence may be sent to the family online at: www.thelakefuneralhomeandcrematory.com. The Lake Funeral Home and Crematory is assisting the Marrinan family with arrangements.